The focus of the Delta BLUES Beacon pro ject was to improve outcomes for diabetic patients by making use of innovative technologies and clinical interventions to improve the management of this debilitating chronic disease. This Delta Health Alliance project brought physicians, nurses, hospitals, clinics, pharmacists, community health programs, and patients together to craft new ways of improving the quality of health care and the efficiency of health care delivery. The project also redirected existing resources out of administration and record keeping and into patient care. 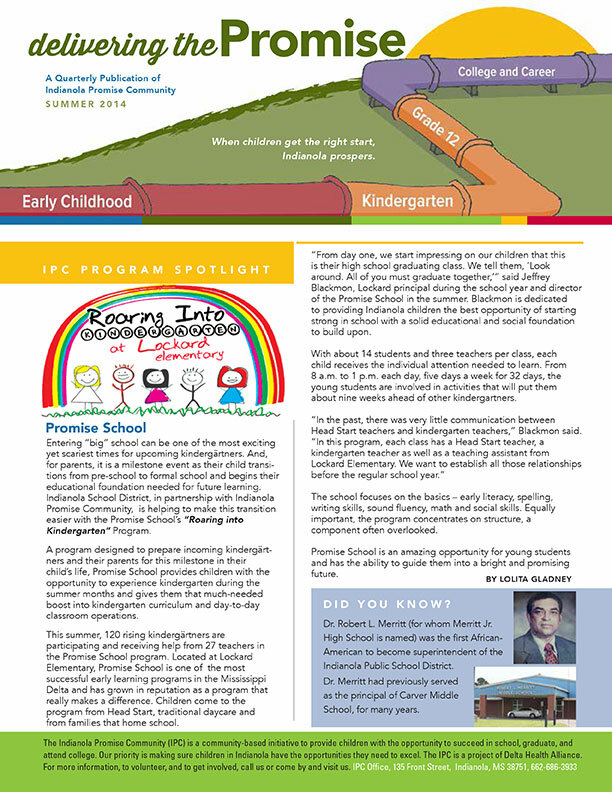 What follows in this booklet are descriptions of some of the 28 programs we are using to build and develop the Indianola Promise Community (IPC). These narrative summaries are told from the perspective of the individuals who are participating in these programs and helping us learn from their experiences. (Stoneville, MS) – The US Department of Health and Human Services recently awarded a five-year grant to Delta Health Alliance (DHA) to address infant mortality and poor maternal and infant health outcomes in the Delta counties of Holmes, Humphreys, and Leflore. The Indianola Promise Community (IPC) is a community-based initiative to provide children with the opportunity to succeed in school, graduate, and attend college. While it is sponsored by Delta Health Alliance, its many local partners include: Indianola School District, City of Indianola, Delta State University, B.B. King Museum, W.K. Kellogg Foundation, and many others. Our office is located at 135 Front Street in Indianola, though we have staff and volunteers working throughout the city. And while we sponsor many programs, we have one priority – making sure children in Indianola have the opportunities they need to excel, so they “never miss a beat” from birth to college graduation. These are the goals of the Delta Health Alliance Indianola Promise Community PARENTS AS TEACHERS project. Trained staff are working in Indianola to identify expectant mothers and new parents to join the program. This initiative will serve families who are expecting all the way through when their children enter kindergarten. Through one-on-one visits in the home and group meetings with Delta Health Alliance IPC staff, these parents become the teachers in their own homes and neighborhoods. The skills they learn enable them to deliver healthier babies and grow healthier children. This program also makes available to families health and developmental screenings for their children and creates networks among parents so they can help each other. With this kind of personal involvement and on-the-ground intervention, Delta Health Alliance is working every day to secure a healthier Indianola.